Milton Latham grew up in Ohio. Milton Latham graduated from Jefferson College (now Washington and Jefferson College) in Pennsylvania in 1845. After graduation, Latham headed to Russell County, Alabama where he worked as a school teacher, served as a court clerk, and became a lawyer. Latham arrived in San Francisco in early April, 1850. While there, he served as a court clerk until he moved to Sacramento and was elected as the area’s District Attorney. In November 1852, Latham was elected to the U.S. House of Representatives where he only served one term. 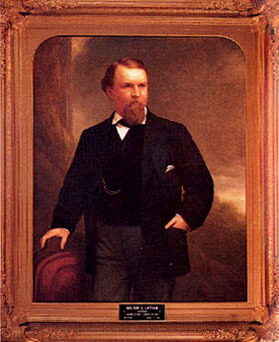 Latham returned to California and served as the Collector for the Port of San Francisco for almost two years. Latham was elected Governor when he was 32 years old. He was a Lecompton (pro-Southern) Democrat, and his election to the office of Governor was opposed by those who feared that he would make California a pro-slavery state. Two days after Latham took the oath of office, the legislature agreed to elect him to fill Senator Broderick’s vacancy in the U.S. Senate. Many believe that Latham ran for Governor because he wanted the available seat of U.S. Senator Broderick, who had been killed in a duel. When he took his seat in the Senate, Latham was its youngest member. Melendy and Gilbert. The Governors of California: From Peter H. Burnett to Edmund G. Brown, Talisman Press, 1965. Schaechtele. The Governors of California and their Portraits, California State Capitol Museum Volunteer Association, 1995.